Files purchased after the date indicated have been corrected and an update has been sent. If you think you found a mistake in a pattern, please don’t hesitate to let us know so we can make the necessary corrections. 16.02.2012: Chart A row 9 ; chart B row 34. 21.10. 2010: in the body, after the ribbing, change to MC and bigger needle and k 2 rows in St st.
Sleeve cast on: 26(28,32,36,38,42,44) sts. Clarification: Picot row ends with a yo. p. 40: marks in the chart corrected, so that central motif is black and orange rose, not green and pink diamonds. 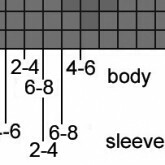 Clarification: marks added for the sleeves. p. 109: Increases and decreases are knitted as follows: Between a and b decrease on both sides *1 st in each garter once (twice) and after 3 garters 1 more st, repeat 5 (4) times from*. Between c and d, increase on both sides *1 st in each garter two (four) times and 1 st in each second (third) garter three times (once), repeat four times from*, increase 1 more st in each garter 0 (4) times. Between d and e, increase on both sides *1 st in each garter once (twice) and after 3 garters 1 more st, repeat 5 (4) times from*. p. 110 and 112: DELETE 4 mm crochet hook. p. 111: Finishing (…) Pick up 50 (60) 70 sts at mid-sleeve. p. 117: Needles: (…) 6 mm double-pointed needles MISSING. p. 119: Color chart and colors in the instructions don´t match. The right colors are the ones figuring in the instructions p. 120.
p. 120: UPDATE from wool producer ÍSTEX: bright red 0078 and red 9009 are both replaced by red 0047.
p.140: sizes indicated in chart pattern D for 4-6(6-8)8-10 instead of 2-4(4-6)6-8. Written instructions correct. p. 141: Tension: 10 x 10 cm (…) equal 29 sts and 30 rows. 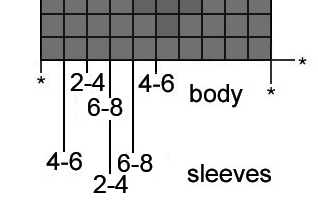 p.142: Sleeves (…) Increase 1 st on each side (at the beginning and at the end) in every sixth (sixth) seventh row 12(13)14 times. It is very frustrating to see mistakes in a pattern book. Mistakes do happen however at every stage of the making of a book, even after test-knitting and tech-editing when book is being layed out and charts redrawn. It’s frustrating and I’m very sorry for the inconveniences it may cause. p 10: Picture caption: Halldóra is wearing the upphlutur. p 25, 30: Leaf mittens, slouchy cap & scarf: the material listed in each pattern is for the whole set, used in proportions of about 15% for the mittens, 25% for the cap and 60 % for the scarf. p 57 Perluband: Halldora beaded chart: extra line of beads on row 9 should be deleted and O letter is missing. As consequence, there are 14 rows missing in the blank chart as well and the row numbering should end with 221 not 207.
p 118-119 Margrét triangular shawl: Missing symbol in chart key: k on RS and WS (garter st borders).Chart A: st 19 /row 3: should be k instead of k2tog. The red frame indicating the repeat is missing around the sts 16-21 /rows 19-25.
p 131 Lacy Skothúfa: Chart: missing ssk symbol on st 4/row 19; st 22/row 25 should be k not s2sk. p.142: Sleeves (…) Increase 1 st on each side (at the beginning and at the end) in every sixth (sixth) seventh row 12 (13)14 times. 12.01.2011: a mistake has been found on line 3 of chart 4 but written instructions are correct. 5.06.2012 and 7.02.2012: after rep rows 15-26, there are 91 sts and not 95 sts and after that the sts count is off by 4 sts on each side (8 sts in all) until the end of the shawl. Row 1 of chart B modified in consequence. Raglan dec: Repeat this, decreasing 5 times in every 3rd row and thereafter in every 2nd row 11 times, until 64 sts remain. 21.12.210: color A calls for 1(1,1,2,2,2,3,3) skeins; Yoke: combine (…) 37(39,43,45,47,51,53,55) back sts. 8.01.2011: Raglan dec method 2, centered lifted dec: At same time, the 4th row and then every four rows, a total of 7(8,9,10,11,12) times: *k to 2 sts before m, s2kp (to do so, you first have to move the m 1 st to the left), k to 1 st before next m, s2kp (to do so, you first have to move the m 1 st to the right)* twice, k to EOR. 21.11.2010: 4 mm needle is US 6 not 8. Decreases: pm after 20(22,24) sts. 6.02.2015: Mark thumb. Right mitten: k29 (not 30). Chart is correct. Thumb chart: ignore (suppress) rnd marked 23. 21.10.2010: Apron: Row 3 (WS): with red, sl 1, *p1b, p1* to 2 sts before EOR, p1b, sl 1, slide. 30.07.2011: Jacket, missing: Graft underarm sts.